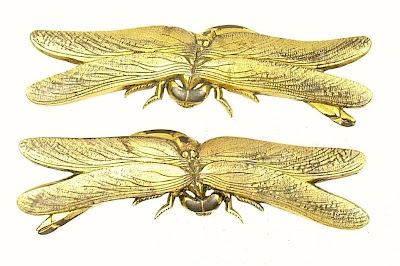 These don't belong to me but they are a lovely example of dragonfly menuki. The image was sent to me by my teachers good friend, a sword polisher by the name of Ikeda Nagamasa San. His late father was a great collector of sword fittings and had a particularly impressive collection of works by Kano Natsuo. Dragonfly's are called tombo, in Japanese, and were a popular design motif with the warrior class. I imagine the swift and erratic flight of these insects could be seen as an inspiration to swordsmen and their precision attacks on their prey would have drawn much admiration. It's interesting to note how such humble, almost unassuming, creatures caught the attention of fighting men in this way, and how the beauty of nature was so sensitively appreciated. The samurai called it katsumushi; "Invincible insect" and it can frequently be seen adorning the front of kabuto, Japanese warriors helmets. An ancient Japanese name for dragonfly is akitsu. According to legend the first emperor, Jinmu, was once bitten by a mosquito which was then promptly eaten by a passing dragonfly. This apparently led to the land being known as Akitsushima; The Island of the Dragonfly. I know Richard Turner likes them too...so these images are especially for you, Rich. I've been taking a bit of a break lately, from the steel rocks. I've been instead working out how best to render dragonfly wings in a convincing way. I don't mean hyper realistic...just convincing. There is a difference. Today, however, I need to get back to some hammering. Here's where the larger stone is, nearly there...maybe tomorrow. This image is just to mess with Simon ;-) and to leave him wondering how you actually hammer metal, which normally spreads and thins it, in a way that contacts the outer circumference. I'll reveal all soon...it's actually the basis of all real raising and the principle still amazes me. Intrigued? In November of 2005, a week after returning from a month in Japan I was joined for 3 weeks, in my studio, by Patrick Hastings. Many of you will know him and his work but for those of you who don't, here's a link to his site. I'd noticed him on-line, on various fora, and was impressed by his efforts to make some headway into the world of classical Japanese metalwork. I, somewhat presumptuously, contacted him with an offer of support in terms of technique and whatever else I might be able to add. After many lengthy emails and phone calls I invited Patrick to visit us in England so that he could get more of a taste of what I was doing. He jumped at the chance and a short while later my family and I found ourselves at Bristol airport greeting a ridiculously large Californian ( he’s 6 foot 7, I think ) and wondering how we were going to squeeze him into my tiny studio. Our very dear friend and neighbour Karen Todd ( a sophisticated collector of fine Kagamibuta ;-) ) had offered to put Patrick up for the duration of his stay, and so with him trapped nearby I was able to impose a gruelling training program that I'd devised. I hoped this would provide a solid grounding from which he could develop his already impressive skills. He kept his complaining about the hardness of my stools and the lack of space to a minimum and applied himself the tasks I'd set him. We managed to cover a massive amount of material in those short, but intense, weeks. We kept at it 7 days a week and when not actually in the studio I kept the poor bloke up late into the night talking about all sorts of nonsense, some of it even related to Japanese art metalwork. Patrick has written a very generous, and kind, account of this time we spent together and posted it on his website, and although I feel a little embarrassed to direct you there because of that, I never the less would like to continue to support his efforts by doing so. 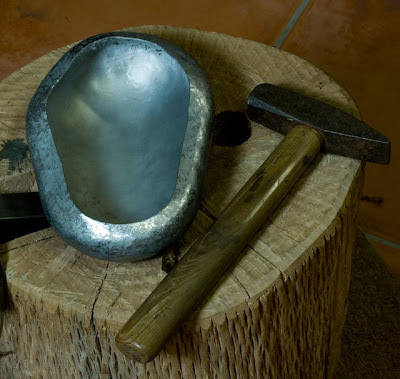 If you have a look in his archive of past work you’ll be able to see the 3 tsuba he made in my studio. He arrived with blanks already prepared to my specifications so we were able to make the best use of the time we had. I think he did remarkably well to put up with my demanding ways and I’m very pleased to see how he has developed his art. I have been very fortunate in my own journey to this point and have had the benefit of many talented and generous teachers. My own sensei in Japan, Izumi Koshiro quite literally changed my life by allowing me into this tradition and all but adopting me. It is almost entirely due to his generosity and friendship that I have anything at all to offer you. I have never paid for the teaching I have been given, by Izumi Sensei, or any of his friends who added various aspects to my training. All that was ever asked of me was my commitment. I continue to devote myself to developing my own skills, and art, and in this small way hope to be able to repay the faith my teacher placed in me. This photo was taken from a newspaper article at the time of my first visit in 1993. 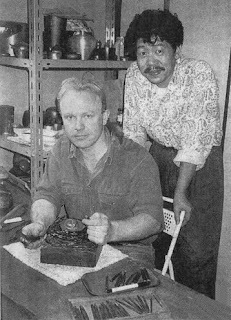 We're both a bit younger here ;-) I think I was working on a shibuichi tsuba with a number of muti-metal leaves in taka-zogan iroe. My life has been enriched immeasurably though my involvement in this tradition and my “adoption” by Izumi Sensei and his family. I doubt that I’ll ever be able to adequately express my gratitude to all those who have given me so much.